"What a charming re-telling of a classic fairy tale! Not just the unique twist at the end, but also the lovingly portrayed environment, the detail, and the overall magical atmosphere conveyed through the narrative are really captivating and emotionally engaging! Also - believe it or not, but I actually have a rabbit named Benny!! :-)) How's that for a coincidence? :)) (It's not the one I'm holding on my profile photo - I have two :))"
This is the short version of the Gaiden. A longer version is in progress. but with a Warlock twist to it. They called her ‘little red’; the girl so shy that she’d flinch at the slightest mention of her name. Her real name was Kathrina, but nobody called her that. The red cloak she donned all her life gave her the name people called her by. Not only that, but she was a very small girl, standing no taller than five feet, despite her being eighteen years of age. Ever since she was a child she had chosen to socialise with nature rather than the people who lived in her village. She had never seen her parents, who according to the villagers, had been killed by wolves when she was just a baby. The village she lived in was apparently cursed, but she had never seen such a creature named ‘wolf’. A ‘wolf’ was a beast of magic, a force people had abandoned hundreds of years ago, and was now forbidden to use. However, some people, like our Little Red, were still born with the ability to use it. Little Red knew she shouldn’t use it, but who could resist something like that? If it weren’t for her ability to use magic, she wouldn’t be able to talk to the forest. That’s right, the forest. There was a huge forest of conifer, oak and fir trees which surrounded the small village and it was home to all manner of creatures, all of which Little Red communed with. From rabbits to deer, every creature was a friend to her. She had even managed to give each of them a name, remembering every single one of them. Little Red had come face-to-face with foxes, mountain lions and even Centaurs, but never had she ever come across the creature known as ‘wolf’, the beast everyone seemed to fear so greatly. But one fateful night, she stumbled across a creature so beautiful that it seemed almost impossible to believe that it was real. The sky was fading to the same gloomy blue it did every night, the endless flurry of snow falling from the heavens. The village was slowly settling down to sleep, and Little Red was eagerly waiting to escape from her hut to wander out into the forest. She was cautious enough not to have anyone discover her adventures; if anyone was to find out where she went, and what she did, her secret would be exposed and there was no telling what would happen to her. She’d be branded as a witch, and most likely executed. It was just another normal night for her, the same danger hovering around her as she prepared herself, her crimson cloak tied firmly to her back, and her small satchel at her side filled with food for both herself and her animal friends. As she waited, she peeped into the satchel, checking for the fourth time that she had everything. There was a small carrot for Benny the bunny, the rabbit she had befriended many years ago. A small piece of bread was there for Hija the doe, her very first friend. At the bottom of the satchel was a neatly prepared sandwich consisting of tomatoes, lettuce and thinly cut ham, made specifically for Christan, the very charming Centaur she had befriended a little over six years ago. She would bring him the same thing every night, it being his favourite. Beside that was a handful of different vegetables and fruits, all cut into little cubes; they were for Felix the arctic fox and Celise, the rather curious cougar. A small pouch of seed was stuffed beside the vegetables. Its contents were for the flock of robins consisting of Ray, Remus, Rita, Rebecca, Rose, Riley and Rafe. Little Red smiled happily as her emerald eyes glistened brightly in the candlelight. She closed the satchel and listened carefully as the door to the hut beside her closed. Making sure her hazel colored hair was tucked into her hood firmly, she slowly pressed her hand against her door, peaking out into the dark village. Nobody was around, so it was time to go! Quickly, she sprang into action – she rushed out of her door, letting it close behind her. A bright smile on her face, her crimson cloak flying around behind her, she raced down the gravel path, heading towards the forest. It was colder than usual, but it didn’t bother her. The wind howled quietly as she rushed down a grassy slope and entered the dark forest. Little Red knew the forest better than she knew the village she lived in, having come here every day since she was able to walk. As soon as she entered, the glum, ominous atmosphere lit up, a trail of silver light dancing around behind her as she raced past the trees, heading toward the small clearing she met her friends in every night. After running for a few minutes, she slowed, reaching her familiar spot. There was a small clearing surrounded by many towering fir trees, the full moon directly above them. Little Red sat down, pulling the satchel from her waist and placing it on the ground, looking around expectantly. It didn’t take long for them to arrive, either. From behind the trees, a group of forest dwellers emerged, staring at her bright-eyed. As it twitched its ears, a timid doe walked out from behind one of the trees, approaching Little Red as she smiled happily. A male Centaur slowly followed, holding his hands behind his back. A group of robins chirped quietly as they descended from the trees above, two of them landing on each of Little Red’s shoulders and the others on her lap. A rather shaggy-looking rabbit pounced out from behind another tree, one of its ears chewed and torn, sagging down past its face. The last two to show were the artic fox and a small cougar, both approaching her slowly, shy looks on their furry faces. Little Red smiled brightly and held out her hand; the fox purred as it placed its head in her hand, gazing into her eyes. The fox lifted its head in surprise and then looked over at the cougar which leaped over and stood at its side, gazing up at Red. Red reached into her satchel and slowly pulled out a handful of the cube-cut vegetables and fruits. She picked up one of the cubes and threw it forward, giggling as Felix the fox pounced into the air and caught it in his jaws, squeaking happily as he chewed it. Red then picked up another and threw it up, smiling as Celise the cougar caught it in her jaws, purring as she ate it. The Centaur slowly sat down beside her, clicking his hooves together, ‘’Little Red’’ he smiled. ‘’Christan’’ she smiled, looking up at him, ‘’I didn’t forget, don’t worry’’ she said, pulling the sandwich from her satchel and handing it to him as he smiled gratefully. Throwing another cube to Felix and Celise, she reached into her satchel and pulled out the bread, holding it up as Hija the doe took small bites out of it, looking around nervously. Then, the rabbit started jumping up excitedly, ‘’me, me, me, me, me!’’ he chanted, looking up at Red as she smiled down at him. ‘’Benny’’ she smiled, dropping the pile of fruit and vegetable cubes onto the ground in front of Felix and Celise. She reached into the satchel, still holding the bread for Hija, and pulled out the carrot, holding it out to Benny as he chattered his teeth together with excitement. This was what Little Red did every night; she would come out to this clearing to spend time with her friends, the only creatures that didn’t judge and look own on her. Out here, she could be whatever she wanted, and could use her magic without the fear of being branded as a witch. These friends of hers meant everything to her, and if it weren’t for them, she would be totally alone, something that she had always been afraid of. As Benny took the carrot, she reached into the satchel and pulled out the pouch of seed, pouring it into her hand as Hija finished the bread, sitting down beside Christan who was humming happily as he ate the sandwich. Then, she held it up to the robins on her shoulder, smiling as they pecked away at it. The first, who was sat on her right shoulder, was Remus, the oldest of the flock. The second, on her left shoulder, was Rita, Remus’ mate. Those on her lap were the two’s children, Ray, Rebecca, Rose, Riley and Rafe. They were slightly smaller than their parents, but all of them were equally beautiful. Once Rita and Remus were finished, she held her seed-filled hand down to the younger birds as they bowed their heads to her in thanks before eating. ‘’How was your day, Red?’’ Remus chirped, hopping around on her shoulder. Remus chirped rapidly, like he was laughing, making Red giggle. Like they always did, their harmonic meeting lasted the majority of the night. Little Red took her time to listen to each of their stories, Benny talking about his courageous hikes through uncharted parts of the forest in search of food, stumbling across a rather beautiful female rabbit. The way he spoke about her made Red believe he may very well have fallen in love with her. Hija spoke about her troubles with her older brother, the dominant male of her herd. He had apparently been causing issues with a neighbouring herd, and there was a strong possibility of a turf war starting. Hija really didn’t want that to happen. The family of robins spoke about everything they had seen and heard throughout the day. Christan, as always, boasted about his family of warrior Centaurs, who lived to protect this forest, stating that they had recently scared off a group of hunters searching for an escaped witch. Felix didn’t say much, he just sat there and listened to everyone else’s tales. Celise had left after receiving her food, but that was normal; she was a very private creature, but they all knew that she appreciated Red’s company for the short time she spent with them. As it got later, Red decided that it was time to leave. She picked up her satchel and waved goodbye to all of her friends as they scurried back into the forest, thanking her as always. She smiled and climbed to her feet, gripping her crimson cloak tightly, the harsh breeze getting colder as time passed. As she always had, she planned on heading straight back home, but little did Little Red know that this night was going to be far different from every other. Little Red started walking back, following the same path she took every night. However, for some reason, tonight, the path seemed to be a little less familiar. She stared down at it as she walked, noticing that beside her footprints, were those of something she had never seen before. The prints were rather large, a little over twice the size of hers, and they looked similar to Celise the cougars, but they were far too big to belong to her or any other cat. A freezing wind raced past, making her cloak violently fly around – she grabbed the front of it as her hood fell back, revealing her hazel hair, so long that it felt down past her waist. It floated around gracefully, the wind slowing. But as she went to pull her hood back over her head, an ominous feeling washed over her, everything around her suddenly falling silent and still, like time had stopped. There was no sound coming from the wind swaying through the tree tops, no rustling from the forest dwellers shuffling around – it was far too quiet. But that was when she heard it: a loud, piercing howl – no, a cry… a sad, longing howl. It was too full of emotion to have been the wind, and far too loud to be a fox – so what was it? Red turned around, staring back into the trees behind her, the strange feeling of uncertainty growing. She could feel her heart racing, butterflies racing around in her stomach – she was both afraid and curious. Whatever had made that sound had to be around here somewhere, and she wanted to find it. However, Red had failed to realise that the owner of the howl had already found her. Little Red flinched, a pair of light green eyes suddenly appearing from within the darkness ahead of her, their pupils thin like a cat. She didn’t know what to expect; the fear she was feeling told her to run, but her curiosity had her frozen on the spot, gazing at the eyes as they glared back at her. Suddenly, the eyes started moving closer, the silence broken by quiet, low growls coming from the same direction as the eyes. But Little Red didn’t run. She remained there, staring, waiting. From the darkness, a creature she had never seen before emerged, its body covered in a thick coat of white, bushy fur. It stood at least five feet tall, two tall, pointed ears on its head. The creature stood on all fours, a long, bushy tail swaying behind it, much like a fox. Staring into its eyes, she recognised a mutual look of curiosity as it stared back. A scar cut down through its right eye, spreading down to its cheek. In all the time she had spent in this forest, Little Red had never seen such a creature, but it was truly beautiful. At first glance, she would have thought it was a cross between a fox and a dog, but it was much too big to be either. Her curiosity increasing, Little Red reached out her hand to stroke the creatures head – abruptly, the beast snarled and backed away cautiously, glaring at her hand, growling quietly. The beast growled lowly, its cautious expression slowly fading, staring at her presented hand. Slowly, backing away every couple of seconds, the beast gradually brought its head to her hand, allowing her to run her fingers through its thick, soft fur. Startled by how soft the creatures fur was, Little Red gasped. Why had she never seen this creature before? It was so beautiful, so unique – what was it? Slowly, Little Red moved her hand down under the creature’s jaw, lifting its head so she could stare right into its eyes, moving closer to it. It remained where it was, watching her as she moved closer. Staring at her, the creature seemed to struggle, growling as it dragged its head away from her hand. It backed away cautiously, swaying its tail slowly, making sure not to take its eyes off her. Before Red could say anything else, the beast spun around and sprinted back into the darkness, leaving her alone. That was where Red’s night ended. She frowned, but headed home, unable to stop thinking about the creature she had just met. The next night, Little Red planned to find the creature that had approached her the previous night, determined to find out what it was. She packed her satchel full of the usual snacks, ensuring not to neglect her friends. She set out once again, racing into the forest and meeting her friends in the same spot. She gave them their food, and listened to their stories, their meeting coming to a rather quick ending. After saying goodnight to her friends, she headed back again, hoping to meet the strange creature again, and to her relief, it appeared before her again. This time, it was less cautious when approaching her, a curious look on its face. As she held out her hands, it placed its head in them, staring into her emerald eyes. Little Red gasped, startled by his quiet, nervous voice. He sounded young and sad, like he had been alone for a very long time. She gazed at him, waiting for him to continue. But to both of their astonishments, Little Red was not afraid. Although her village spoke of how dangerous and monstrous such beasts were, not a single flutter of fear came across her. If this really was a wolf before her, it was safe to say that the villagers were so very wrong. This wolf was a beautiful creature, and he had such a pained look in his eyes. Why did the people fear his kind? What had they done to deserve such cold hatred? He shook his head, ‘’it is not magic that draws me to you’’ he said. Once again, the wolf gained a reluctant stare, but as he stared back into her eyes, he couldn’t refuse to answer. He backed away cautiously, ‘’there is something familiar about you’’ he said, ‘’you feel… familiar’’ he said slowly. ‘’Familiar how?’’ Little Red asked, but she wasn’t going to receive an answer. As soon as he had answered her first question, he fled back into the darkness, disappearing once again. Little Red frowned sadly; if that was a wolf, what was so dangerous about him? All she saw when she looked at him was a lonely, lost soul. There was no hint of danger nor uncertainty lingering to him, so why did the people fear his kind so much? Once again, Little Red turned around and headed home, hoping to meet the wolf the next night. But over the next few weeks, Red had not seen the wolf again. Each night, she had waited on her path, hoping that he would show, but he didn’t. Remus hadn’t mentioned seeing anything like what she described the wolf as, and he hadn’t mentioned the cloaked figure once. Red couldn’t help but think the wold had a relation to this figure, considering as both had disappeared at the same time, but she didn’t know him well enough to be sure. In her hut, Little Red proceeded to pack her satchel as always, but while she was doing so, she overheard some of the villagers outside talking. Upon the mention of the word ‘wolf’, Red flinched, her heart racing – could they be talking about her wolf? The wolf she had seen in the forest? She listened closer, pressing her ear against her door; the people continued talking, saying that there had been sightings of a wolf in the surrounding forest, and that there was a bounty on its head. Creatures of magic were hunted so vigorously that Red was surprised there were even any left. The people continued talking, warning each other to keep an eye out and kill the beast if possible, and that upset Red greatly. Her wolf didn’t deserve to die, did he? Continuing to listen, the people stated that the wolf had killed at least twenty people, and could very well be the beast that killed the people in this village many years ago – could they mean Red’s parents? As the people left, Red flung out of her hut, leaving her satchel behind. She was desperate to find the wolf; she had to know if the things those people had said were true. If the wolf she had met was responsible for her parent’s deaths, she had to know why he had decided to show himself to her. Could it be that he was feeling remorse? Or guilt? She wasn’t sure, but she had to know. She raced into the forest, breathing frantically as she searched around for him, but there was no sign of him. Little Red searched for what seemed like hours, until coming to an abrupt stop in a part of the forest she had never been in before. And it didn’t take her long to regret her decision to race out here without thinking. The darkness around her was suddenly lit up with hundreds of pairs of green, yellow, red and orange eyes, a mirage of differently pitched growls echoing around her. Her heart was instantly filled with fear, making her gasp as she backed away slowly. But then, a familiar voice suddenly came from behind her, ‘’this part of the forest is cursed’’ he said. Red turned around to see none other than her wolf, his light green eyes staring at her, his furry face just inches from hers. He stared at her, waiting. Staring at him, Little Red wasn’t sure how to feel, ‘’so, you did kill them?’’ she asked. She gazed at him, her heart racing. Was it true? Were her parents like him? If that were so, how was she not a wolf? But Little Red found it hard to believe. She was not a wolf. But for some reason, she felt like this wolf was what she had been waiting for. Ever since she was a child, she had always longed to understand her purpose, and understand why she had magic if she was forbidden to use it. Could it be that this wolf was sent to guide her? He seemed to know her name, and he claimed to know what had happened to her parents, so could it be? 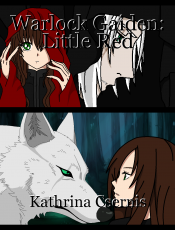 Little Red gazed at the wolf as he looked down at the ground, sadness lingering in his eyes. If it really was her purpose to bring his kind and the Human’s together, why hadn’t she been told sooner? If he really was the last wolf, then her purpose was to have him live alongside Humans in peace. And that was what she would do. The wolf’s eye’s widened with shock, ‘’friend?’’ he asked. Little Red nodded, ‘’that can be your purpose: to be my wolf’’ she smiled. The wolf seemed happy, a slight smile appearing on his face as he stared into Red’s eyes. He looked at her expectantly, waiting. She thought hard, trying to come up with something that suited him. She wanted it to be something meaningful, something that related to his sudden appearance, to her suspicion of him being sent by something godly – but then, it came to her. Upon naming him, a strange aura suddenly started hovering around them, silvery streaks of light falling from Red’s hands, wrapping around the wolf’s body. Red was startled by it, but the wolf seemed to be relieved, the light consuming him as she held onto his face with her hands. Just moments later, the wolf had been completely consumed by the light; Little Red didn’t know what was happening, but she kept her hands on his face, his warm fur still brushing against her skin. But then, in what seemed like half a moment, the feeling of his fur vanished, replaced with what felt like another Human’s skin. The silvery light spun around crazily, sparks of light floating above the two of them as Red stood there, staring in amazement. But then, the light started to fade… Little Red gasped in shock, staring ahead. As all of the light cleared, someone else was standing in the wolf’s place. It was in fact a man, her head reaching his shoulders. Like her, he was wearing a cloak, but it was black in color, covering everything but his pale face, a scar cutting down the right side of it, past his eye. His eyes were the same as the wolf’s, light green and with pupils like a cat. His hair was white, falling just past his ears, and he looked around the same age as she was… was this her wolf? Little Red frowned, her hands still on this man’s face. He stared at her, a bewildered look on his face, but she could see something else in his eyes. In the place of where that sad, lonely look had once been, was a look of happiness, relief, and love. He smiled, ‘’Little Red’’ he said in the same voice that the wolf had had. Slowly, she took her hands off his face. Was this her purpose? Was she supposed to free the wolf from his solitude as a creature everyone hated, and turn him into something they would accept? Little Red shook her head, ‘’I know there are more of you, and you will help me find them, right?’’ she asked, gazing into his eyes. She smiled. At last, she knew what she was supposed to do. She took Elijah’s hand and stared out into the forest. A long, perilous journey awaited the both of them, but Little Red knew with her wolf at her side, she would be able to do it. And so, the two set out, beginning their journey to find more of the creatures known as ‘wolf’. Little Red had found her purpose, and didn’t hesitate to act upon it. It didn’t take long for her to fall in love with the wolf, and she had found that to the world, one may be a bad wolf, but to one person they can be the world. After meeting wolf, Little Red’s world dramatically changed, and she had found a happiness she had thought she’d never achieve. She realised that if she had chosen to run from the wolf that day, she would have never found her purpose. Both wolf and Little Red learnt that the most beautiful things in the world cannot be seen or even touched, they must be felt with the heart. Sometimes, the wolf isn’t the monster, but the people who claim it is are. A realy beautiful and magical read, Kathrina! And that last sentence -- isn't that just the truth. Excellent. I loved the story! What I especially liked was the unique take on a classic tale. Keep up the great work, Kathrina! This was really good. I liked how you turned a fairy tale story into one of your own using your own characters. It had all the elements of a fairy tale as well. With her sitting in the forest talking and eating with all the animals, to the magic and finally the happy ending. I really enjoyed this. I can't wait to read some more of them this was very cool indeed. I don't know why, but I kept forgetting to read this hahaha. But now, her I am, lol. First I wanna announce my love for red riding hood like, spin-offs? (If that made sense). I don't know, maybe it's just I love hoods and the color red hahaha. Anyways back to the story, so cool. This still has the vibe of a fairy tail, like it's magical? In a sense. It's also refreshing, you know, straying away from all the drama and action going on in the series. The descriptions are amazing. You described the forest and inhabitants so wel. Also, in the animals, the cougar is me at parties, xD. This was really beautiful, a lot different from your series, and I like that! I can't wait to see more like this! Aside from some points I've brought up in this short within the icomments, you've created an excellent re-imagining of the Little Red Riding Hood fairy tale. It kinda reminds me of a recently airing TV show called "Grimm" here in the US, but only just slightly. As an aside, I see you love to place yourself into the story with the main's naming convention of Katherine. This is fine for what you've done so far, but eventually its going to get old on your readers if you can't get beyond using the same names you've created for your epic stories. This is just a bit of honest feedback you might want to considered. i did like the scope of the story and it was overall an enjoyable read. Your ending is something I've seen done before in a couple of movies, but you did it quite well in this little tale here. Nice job, Katherine. and the last line is very true. It's great! I love it and I can't wait to see if you write more like this! This was really good, I really enjoyed it. This was really sweet, nice work. I loved it! This was amazing and I can't wait to start on your series! Cindy Anter and her so unreal Fantasy Characters.